Humans, dark and disturbed creatures that we are, love to imagine what would happen if a massive comet struck the Earth. But what if a giant ice rock flung itself into the Sun? A team of astronomers did the math to figure out what would happen. “I give talks about these and I call them supersonic snowballs in hell,” John Brown, Astronomer Royal for Scotland, told New Scientist. As small comets approach the Sun, they start sublimating quickly under the intense radiation, eventually cracking apart. But several large comets have actually managed to pass through the Sun’s outer layer, or corona, and continue on a bit worse for the wear. So, what if instead of grazing the surface, one of these giant bolides slammed headlong into the Sun’s lower atmosphere? First off, falling into Sun’s gravity would accelerate the comet to a blistering speed of over 600 kilometers per second. Drag from the Sun’s atmosphere would flatten the poor sucker into a pancake right before it exploded like a bomb, unleashing as much energy as a coronal mass ejection. 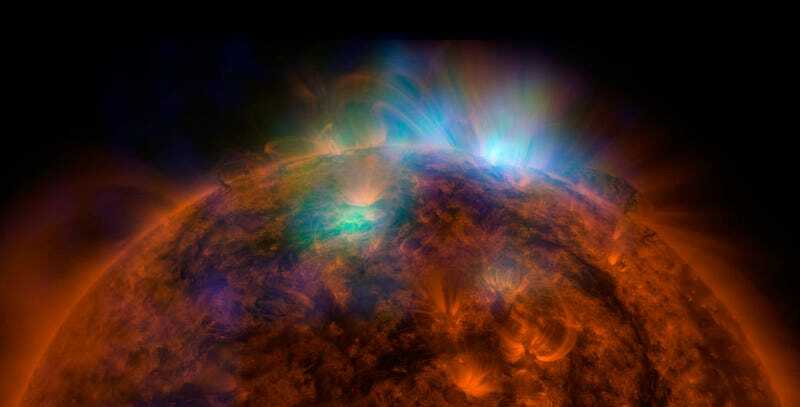 The explosion might even cause sun-quakes to ripple throughout the atmosphere. Here on Earth, we’d probably detect a burst of UV light and x-rays. In order to meet this spectacular fate, the comet would need to weigh at least 10^9 kilograms, roughly as much of the Great Pyramid of Giza. That’s 100 times lighter than comets ISON and Lovejoy, both of which have grazed the Sun’s surface in recent years. So, while very unlikely, this particular astronomical phenomenon is definitely within the realm of possibility, and I for one and going to keep my fingers crossed. Sun-quakes sound 100% awesome.